For the burgeoning, globe-trotting fashionista, the mini rodini™ Seahorse Wing Swimsuit is a swimwear essential you'll definitely want to pack. One-piece swimsuit crafted from a recycled polyamide fabric featuring UPF 50+ sun protection and an eye-catching seahorse print throughout. Ruffle trim at the leg openings. 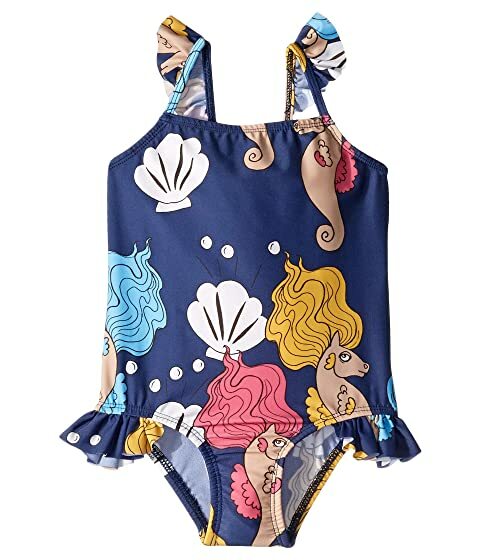 We can't currently find any similar items for the Seahorse Wing Swimsuit (Infant/Toddler/Little Kids/Big Kids) by mini rodini. Sorry!